To children, the story of Yonah is thrilling and exciting. To adults, it represents the essence of Yom Kippur. 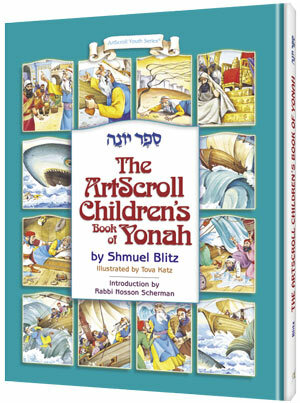 In this beautiful new book, Shmuel Blitz speaks to all ages as he tells the story and delves into its deeper message. Hashem sends Yonah to tell the people of Nineveh that their city will be destroyed. The prophet boards a ship and tries to escape -- but no one can escape from Hashem! Yonah ends up in the belly of a huge fish. He repents and delivers Hashem's message to Nineveh. They repent and are saved -- but Yonah is sad. Why? What is the real meaning of repentance? Why did Yonah try to run away? Children will love the story. They'll want to hear it over and over again. We all know Shmuel Blitz from his Bedtime Story books. Here he presents the Book of Yonah with a simplified children's translation and he adds to our understanding with "Did You Knows" and "Closer Looks. :" Your children will love them -- and so will you! Tova Katz's full-color illustrations make the book come alive, and Rabbi Nosson Scherman's introduction adds understanding and perspective. All in all, this book is a treasure not only for the days before Yom Kippur but even all year round. Large 8 ½" x 11" page size, lavishly illustrated in full color.